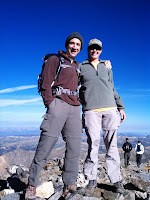 Diane and I hiked our very first 14er last weekend, and as a bonus we bagged a second peak. Grays Peak, and the nearby Torreys Peak, are the two most popular 14,000-foot peaks in Colorado, especially for first-timers like us. 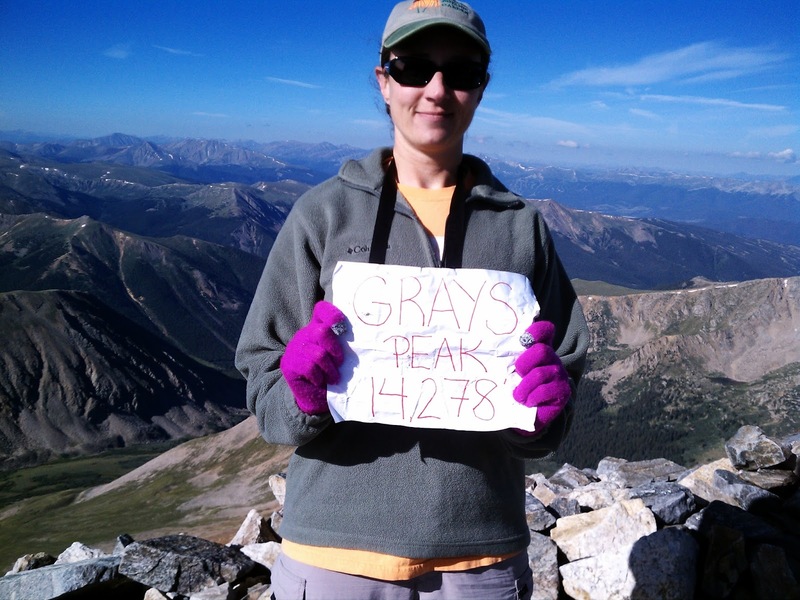 This is because they are very easy peaks to summit - Grays can be done with a Class 1 hike - and also because they are easy to get to from Denver. Just take I-70 west past Georgetown, jump off at the Bakersfield exit, and drive the terrifying Stevens Gulch Road up to the trailhead, and you're all set. The adventure started on Saturday right after a quick lunch in Denver. We headed out on I-70 and only a few miles down the road we ran into stop and go traffic. An illuminated sign said, "Slow Traffic from Floyd Hill to Idaho Springs", but we were about 5 miles from Floyd Hill. We sucked fumes along with all the other weekend warriors for an hour or so, and cranked it back up to the speed limit shortly after traversing the Idaho Springs tunnel. I've heard about I-70's epic weekend rush hour, but I hadn't experienced it until now. The guide books all say that you should use a high-clearance vehicle on Stevens Gulch Road, and they are not kidding. We took the trail-rated Jeep Liberty, threw it in 4wd, and crawled up the rocky hole-covered 1-lane road. It was made even more exciting because we started our trek about 1pm on Saturday, just as the early Saturday morning hikers were breaking camp and heading back down. Several times we had to balance on the edge of a drop-off or back up a ways to find a wide spot to let a line of cars come down the opposite way. This also limited our ability to avoid some of the potholes and wash-outs. I heard a couple of scrapes on the undercarriage of the Jeep on the way up. As we got close to the trailhead parking lot, we were shocked by the huge number of cars parked along the side of (ie in the middle of) the road. There must have been a thousand hikers on the site, based on the number of cars. We timed it well, though, getting there after Saturday morning folks had started to leave but before most of the Saturday evening folks had arrived. We were able to get a spot in the actual parking lot right next to a very nice campsite. 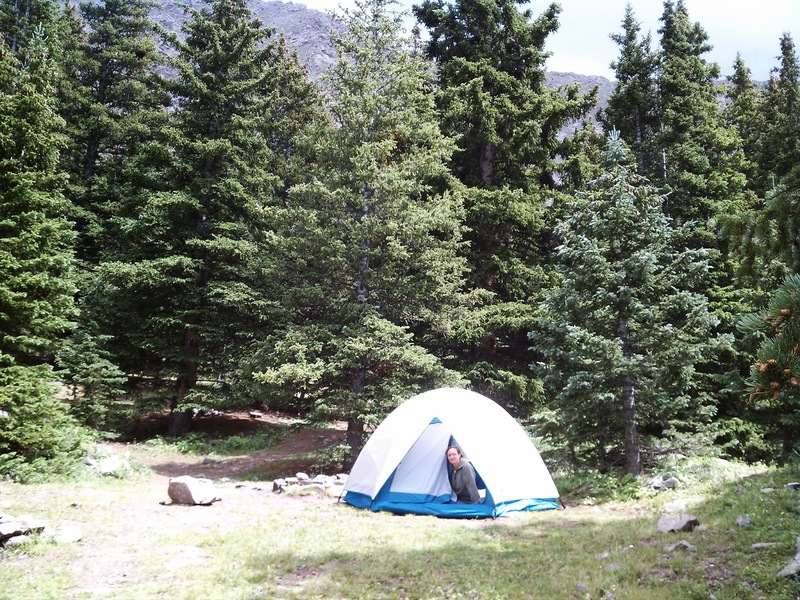 We set up the tent in a light rain, and crammed all our sleeping gear into it just as the thunder started to rumble. 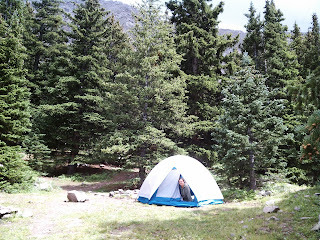 We spent a lazy cozy hour or two reading and snoozing while the rain pattered on the tent. We had brought enough food to eat dinner in camp on Saturday night, as well as breakfast and lunch on Sunday. But about 4pm we decided to head into Silverthorne to pick up some dinner. I wasn't thrilled about trying to drive Stevens Gulch Road in the dark, so we hit up a Jimmy Johns and brought it back to camp. It wasn't all that different than the sandwich parts we had in the cooler, but I also got a Frappuchino out of it, so I wasn't complaining. Diane liked Silverthorne, too; this was her first visit to a real Colorado ski town. The alarm was set for 4:00 the next morning, so we hit the sack early. Our lullabies consisted of a barking dog and some idiot trying to split a firewood log with a camp shovel. He succeeded, broke the shovel, or gave up eventually; I didn't investigate which. The next morning we awoke in the pitch black, affixed headlamps, and started the process of fueling and gearing up for the hike ahead of us. I was hoping to be on the trail by 4:30, but I knew it was probably optimistic. Sure enough, we set out about 5:00. The beginning of the trail is very easy, which helps when you're navigating by headlamp. It wasn't long before we could see the mountains against a lightening sky, and about three quarters of a mile up the trail we rounded a bend and were finally able to see both peaks illuminated in the sunlight. 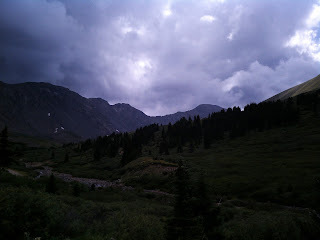 The trailhead is just about at the tree line, at 11,300 feet. Not far from the start, the pines fade out and the largest vegetation are shoulder-high bushes - I think mountain mohagony, but I'm not sure. These then dwindle in size and frequency until they disappear completely, yielding to alpine tundra. When the bushes were about waist high, still in the pitch black, we both decided that the longjohns that seemed like such a great idea back at camp were now a little on the warm side. Taking advantage of the bush cover as well as the dark, we took turns doing a costume change while the other stood guard at the trail. During my post, I must have talked to about 8 people. Pretty busy for 5:30 in the morning. At about 12,000 feet, well into the tundra, we started hearing little squeaks from pikas. Every once in a while one would poke his head out and look at us, but the best picture I was able to capture was his little fat bottom disappearing into the rocks. So I had to settle for scenery, which doesn't flee from cameras. Farther up the trail, the tundra starts to get patchier, and the broken rock piles become more frequent and continuous until eventually it's nothing but jumbled rocks above 13,500. We were really feeling the altitude at this point, and our pace slowed from a comfortable stroll to a plodding death march. The sun and the wind increased at about the same pace, which made further outfit adjustments unnecessary. Unusual for us, we were not passing anyone on the trail, and instead were the ones being passed. This was an indication that we were hiking right at our level of fitness. Same mountain, 500 feet higher. The whole trail valley is visible to its right. We started seeing the occasional hiker coming down at this point, although no one that had passed us on the way up, which was encouraging. I chatted with one for a couple of minutes as I stopped to rest and he stopped to put on sunscreen; he said he had set out at 2:00 that morning, and had watched the sunrise from the peak. Very impressive. We also had a runner go by on his way up the trail. He was visible running back down the trail later while we basked in the glory of the summit; talking with other hikers, it turned out he had run all the way from I-70 - a 12-mile round-trip run with an approximate 5000 foot elevation change, peaking at 14,278. Wow. 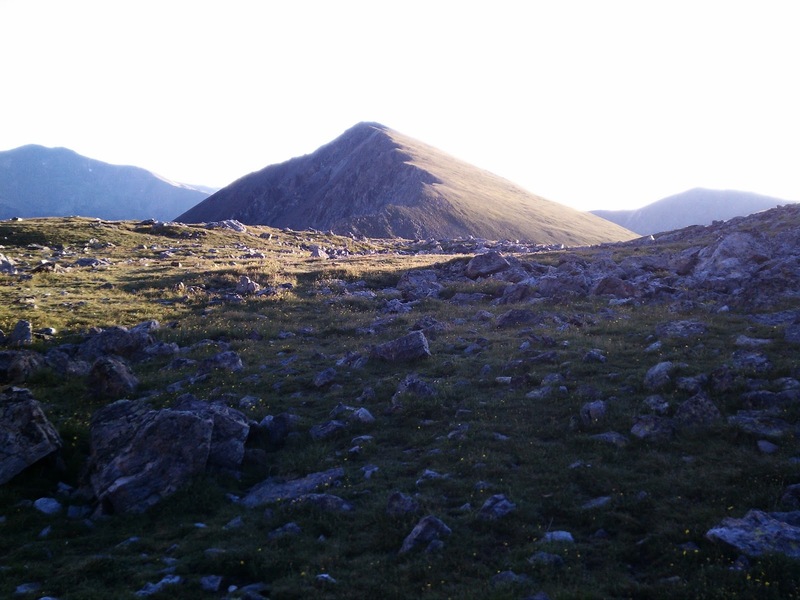 We summited Grays Peak at about 8:30, along with about 20 or 30 of our closest friends. We all hunkered down among the rock piles to escape the wind and had our lunches, chatting about how awesome this all was. We met lots of nice people, and traded picture-taking services freely. Everyone wants to commemorate their achievement, of course. There was an obsessive-compulsive lad there building up the rock cairns at the top into a continuous wall. Not quite sure what his problem was, but it was a little disconcerting having 50-lb rocks dropped on top of the pile I was leaning against. The view, predictably, was amazing. The wind, predictably, was bitter-cold. The sky was the deepest blue I've ever seen. Words don't really do justice to the summit experience, and pictures can only approximate the panoramic magnificence that we all took in, open-mouthed. You really have to go there yourself, and yes, it's worth the effort. 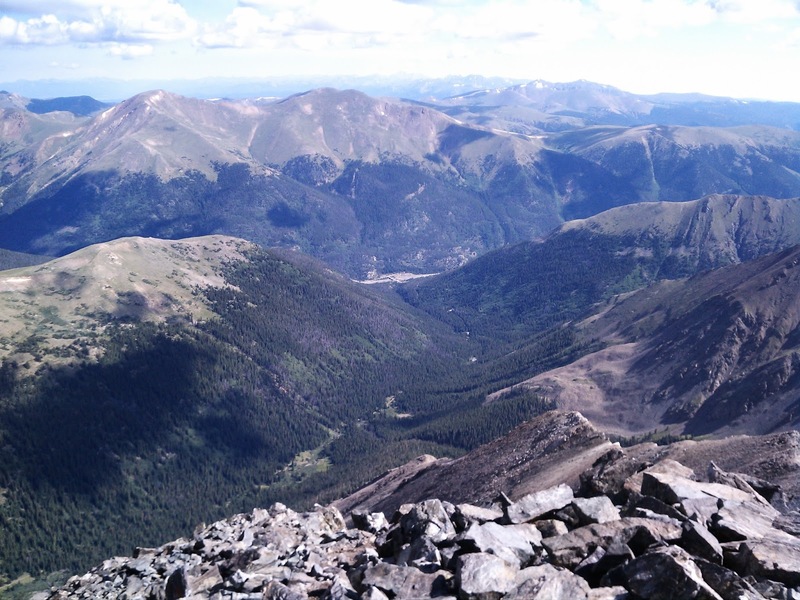 One of the many amazing views from Grays Peak. 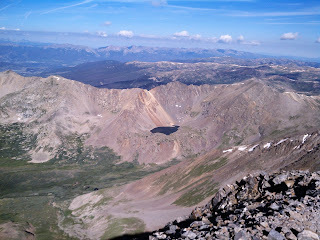 Looking down on Chihuahua Gulch from Grays Peak. The lake which is the source of the stream is at 12,200 feet. Diane provides proof-of-life for the kidnapping investigation. 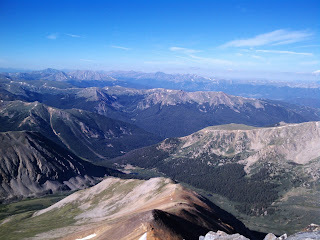 After celebrating, resting, and eating on Grays, it was time to bag Torreys. This is done by taking a trail down the north face of Grays to the saddle that runs between it and Torreys, and then back up the other side. The bottom of the saddle clocks in at 13,750, and Torreys is only about 7 feet lower than Grays, so down we went 500 feet and then back up the same amount. 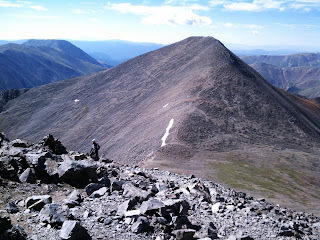 The trail up Torreys is somewhat tougher than the Grays trail, but still easy enough. It is classified as a Class 2, but frankly the elevation was a much bigger factor than the trail difficulty. At Class 2, you're still hiking and not needing your hands, but it's steeper and you're taking larger steps up to get over rocks. Distance from Grays Peak to Torreys Peak: about 1 mile. Not doing it would be crazy. Note the trail running along the ridge of the saddle. 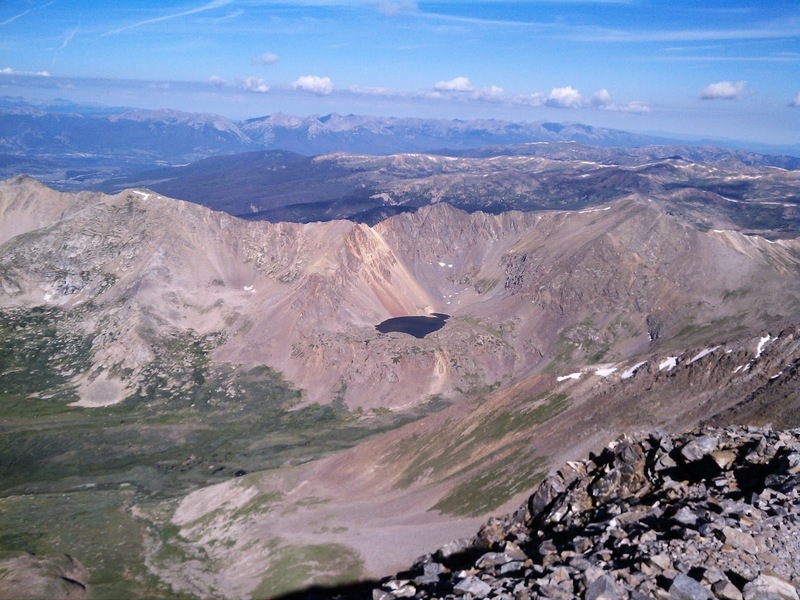 Grays Peak from the Torreys Peak trail. Clearly visible are the switchbacks near the summit. 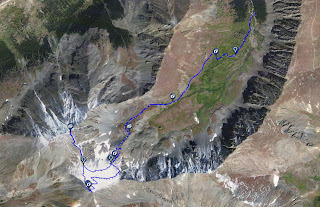 We think they should install a Grays-to-Torreys zipline. 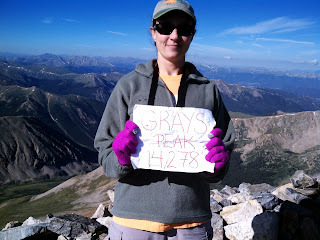 Despite it being later in the day, the crowd at the Torreys summit was no larger than it was at Grays. Grays was getting busier, though. If you look closely at the picture above (click to enlarge), you can see the summit covered in tiny people. Back at Torreys, a couple of college students that we had summited both peaks with were taking pictures of each other jumping on the top of Torreys. It looked like they were having fun, but we were satisfied with just taking pictures with the sign proving we were there. Proof of life, location, and date. Send the ransom, already! After a little more time hanging out on Torreys, it was time to head down. The trail was a lot busier than it was on the way up. We noticed that the farther down the trail we got, the more casual the hikers seemed to be. By the time we dragged ourselves back to the trailhead, we were seeing T-Shirts and sandals on folks with no packs and limited water. I really hope they weren't determined to summit, especially considering the afternoon weather was about to get started again. We took the tent down in a light drizzle, and broke camp about 1:00 pm. Back down the treacherous Stevens Gulch Road, and onto the stop-and-go I-70 again, spending over an hour getting 10 miles back to Idaho Springs. To break up the suffering, we stopped in Georgetown and had calzones at the Alpine Grill - tasty! When we finally made it home, we were ready to sleep for days. For more details and stats about the hike, see my Trimble Outdoors profile. So, which one is next?